If you’re in the Manchester area, you can pick up your own wood pellets by the ton or by the bag! Not sure if picking up or taking delivery makes more sense for you? Check out our Pickup vs. Delivery Cost Comparison. 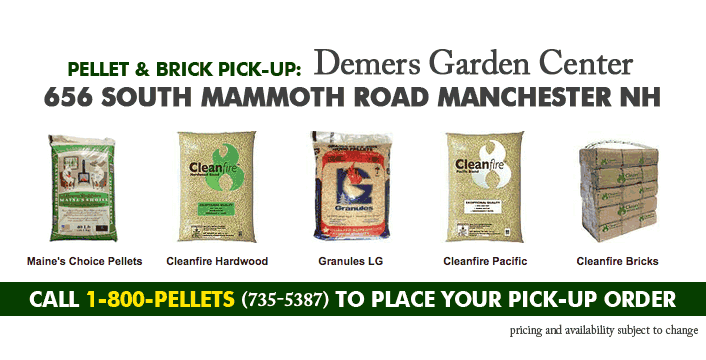 Call 1-800-PELLETS (800-735-5387) and let your pellet expert know you’d like to pick up your order at Demers. We will take your order over the phone – and your Visa, Mastercard or Discover card will be charged for the full amount. If you would rather pay in cash, you can pay there when you pick up your order. Once the order is placed, your fuel information is sent to Demers, with a full receipt emailed directly to you. Your pellets and/or bricks can be picked up Tuesday through Friday from 9AM – 4PM. When you arrive, just give the helpful Demers employees your name, and move your vehicle to where you’re directed. Your fuel will be loaded up – and you’ll be on your way! Directions to Demer’s Garden Center | Call 1-800-735-5387 to order! NOTE: If a shortage happens, this process may be adjusted. We will be sure to keep everyone well informed! Show Us Your Storing and Stacking Techniques! Raw materials brought to pellet mills can arrive in many different forms. Some of the raw material may be sawdust, wood chips, lumber mill scrap, and even full trees unsuitable for lumber. The raw materials may be green, or freshly cut, may be partial dry or even kiln dried. By processing these raw material all in the same way, the end product has consistent moisture content, heat value, ash content, and burn characteristics. Typically, the process starts by running the raw material through a hammer mill. These machines take sawdust and wood chips and break them down into a more consistent smaller size. Large dryer drums are then used to take out any extra moisture. After the drying is complete, the material is processed further in a mill to make an even finer material. Bitter cold temperatures in the Northeast have been relentless of late, and pellet burners are understandably cranking up stoves to keep warm. The colder the weather, the more pellets you’ll be burning. As your supply dwindles, make sure that you are ordering your pellets from somewhere that can get you your pellets quickly. (We’re very happy to report that in most Woodpellets.com service regions, delivery is now within one week!) Stay ahead of your supply level and order before you’re out, or close to being out.